February, 1999, Vancouver B.C. Another Doberman. The third one in a month. The young black and tan female was curled up tightly at the very back of her cage like a scared little cinnamon bun, eyeing me with suspicion. I held out a cookie and spoke softly to her. She came over, wagged her stubby tail a couple of times, and accepted the treat. I noticed that this poor, skinny dog was in heat and wondered how she had ever ended up here as an unclaimed stray; unspayed and unloved. The Vancouver Pound holds strays for seven days, during which they are not walked, cuddled or played with by volunteers. As the volunteer coordinator, I always made a point of notifying breed rescue whenever the shelter gets purebred dogs. Every unclaimed purebred in the pound means that one breeder didn't check a home out properly before selling that cute little puppy. And purebred dogs are best placed by people who know all about the special needs of their chosen breed. I let Ceilidh Campbell of Washington Doberman rescue know when this dog was going up for adoption and waited for the seven days to expire. I stopped in whenever I could to give my dobie a treat and a blanket and tell her she'd be out of there soon. This young dog spent six days curled up in a tiny ball amid the din of the kennels, no doubt wondering why the world had suddenly gone mad. On the day she was to go up for adoption, Sara (as Ceilidh had named her) decided that she'd had enough of this place and started barking ferociously and showing her impressive white teeth to everyone who passed, especially if they were male and wearing a uniform. I came home that night to six frantic phone messages from volunteers and rescue groups wanting to know why Sara was scheduled to be put down the next morning when Dobie Rescue had already agreed to take her. I phoned Barb Fellnermayr, the newly-appointed pound manager , at home and begged for more time. I got it - she agreed to have the behaviourists I was apprenticing with come in and evaluate Sara. Gary Gibson of Custom Canine was scheduled to come and take a look at our newly-ferocious Doberman the next day. Sara put on an impressively fierce display in her kennel for Gary and the staff who had come to watch, but would also take cookies from his hand if he got down and spoke gently to her. Gary's diagnosis? "A terrified, suspicious dog, but she's got good bounce-back and is definitely redeemable in the right hands." The staff did not want Sara released. 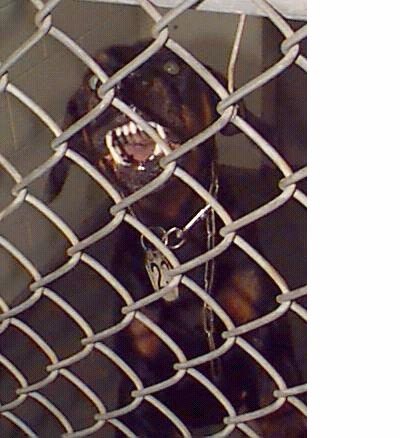 Every animal control officer believed this dog was vicious and a potential danger to the public. Ceilidh knew that Dobermans are very sensitive dogs and often get quite stressed in shelters. And this particular dog was in heat and had had no exercise or direct human contact in over a week. Dogs' death sentences are not usually repealed at the pound. However, at my urging, Barb decided to contact the city lawyers to find out what would need to be done to get this dog released. 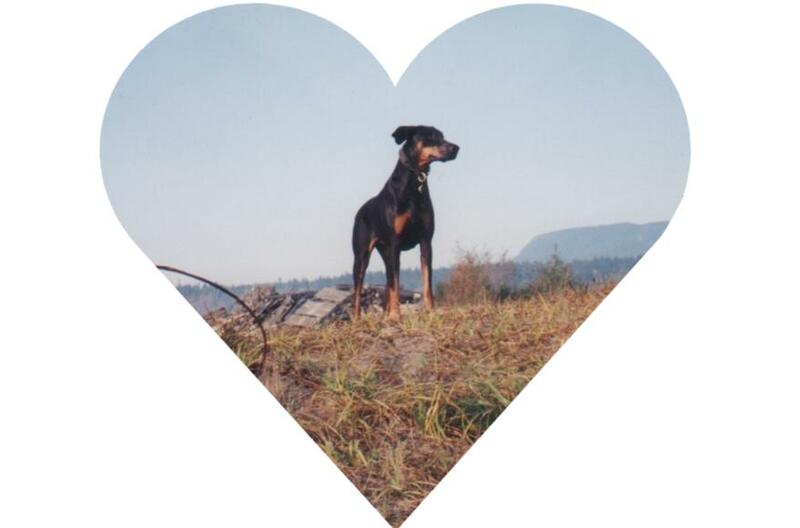 Sara's allies and I held our breath for two more interminable weeks as our dobie got more and more stressed in the pound. I stopped in whenever I could to give her cookies and try to make what could be her last days a little more comfortable. I loved watching Sara with a blanket. She couldn't decide whether to fluff up the blanket or come to me for snuggles and cookies. She would dash back and forth between me and the blanket, completely ecstatic at this bit of warmth and happiness in her world. Finally the word came. Dobie rescue could take Sara, but only if they signed a lengthy document agreeing to spay her, take her in for training, and put her down themselves if she was indeed vicious. That Saturday, Ceilidh drove up from Washington to sign the paperwork. Sue Coghlan, another rescue supporter, met us at the pound and paid the adoption fees, and I was given the honour of finally walking our rescue out of the shelter. Sara was thin, grey with grime and covered in lick sores. She had worn her nails down to the quick on the concrete but despite her sorry condition was still a beautiful dog, with her long, expressive uncropped ears and athlete's build. Ceilidh said she had the signs of good breeding and we again wondered what had happened to her owner. We took Sara to the tennis courts, where she stretched her legs at last and met and flirted with Ceilidh's charming male Doberman, Rupert. I agreed to take Sara home with me for a few days so she could be spayed and have her shots before crossing the border. We bonded immediately. Sara clung to me like a limpet, as most rescued dogs do. Actually it went beyond that – Sara quickly destroyed a door trying to get to me when I tried to give her a bit of quiet time in another room. People who think they have to get a puppy "so it will bond" with them should try rescuing a shelter dog one day. It's a little like growing an extra limb! Sara was shy with new people, especially men, but behaved impeccably with my other dogs, including Chinook, my aggressive male. She'd had very little training, but Sara still managed to impress everyone in our agility class with her aptitude for the obstacles and willingness to try anything I asked. Everyone who saw us together couldn't believe she'd just come from a shelter. My good friend Rob saw us together and immediately said “You two just fit together. This is YOUR dog”. I laughed it off at the time – I have fostered dozens of dogs and loved them all. However it was harder than usual to hand her over to Ceilidh four days later, since Sara had already decided that I was HER person. However, this was our contract with the pound. Sara did well at Ceilidh’s – she fit in well with her pack but was reactive about any negative handling and would snap at the bottle if she was squirted for chasing the cat. The weekend after Sara arrived, one of the pound employees who had campaigned for Sara’s euthanasia dropped in for a surprise visit at Ceilidh’s house. No doubt he expected to find her in a Hannibal Lecter kennel out back, shackled and muzzled. Ceilidh let her whole pack of dogs out, including Sara, and they circled the yard once, then went to say hi to the ACO. He went back to Vancouver and told no one about his visit. I also paid Sara a visit halfway through her month in Bellingham. She knew it was me before Ceilidh opened the front door and launched herself at me, teeth bared in a happy Dobie smile rather than fear, stubby tail wagging ferociously. At the end of the visit, Celidh told me I should not visit again unless I was going to adopt Sara – it was too hard on her to lose me again. She moped after I left. However, with three dogs, my boyfriend and I were already at Vancouver’s legal limit and I knew I just could not take this dog. During the last week of the April, 1999, my universe exploded. Chinook’s medication stopped working again and after a final, terrifying psychotic episode, Bob and I made the final, painful decision to euthanize him. Without our problem child to hold us together, our relationship also ended and I found myself off on my own with only one dog. I swore long ago that I would never have an only dog and the solution became clear. Two days after Chinook’s death I drove to Washington and adopted Sara. Her rehabilitation has been a challenge, but a delightful one. She has enjoyed learning obedience and agility as she regains her trust in humans. The day she ran up to a big, scary man on the beach...and asked for a bum rub, I knew the memories of her past were fading. Sara's intelligence and devotion are beyond compare and we both know how lucky we were to meet one another. Indy, Sara and I are now living in posh Marin County, California and spend a lot of time here.